In almost any hiking, backpacking, or camping survival situation a fire is needed. Although it may seem like a simply task, most struggle to construct an efficient campfire. In addition, starting the fire can be a difficult job if you run out of matches while outdoors. Whether it is used as a heat source during cold nights or to cook your gourmet outdoor dinners, it is essential that all outdoorsmen know the proper way of building fires and starting it with and without matches. If you plan to build a campfire, be sure that the area you are hiking in allows fires and if they are required to be built in developed fire pits. Before beginning to build your fire, be sure to have water available nearby and a shovel to throw dirt on the fire if it gets out of hand. Next, there should be a proper fire pit. 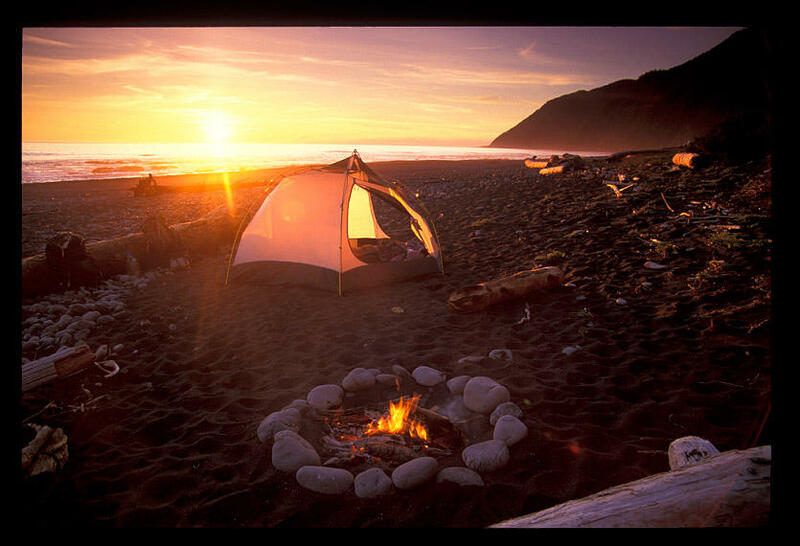 If there isn’t one already, build a small fire ring with rocks. To prevent wind from blowing your fire out, create a depression in the ground 3-6 inches (7-15 cm) deep inside the fire ring. Tinder: Small materials that will ignite easily with a spark kindling such as dry grasses, shredded bark, fungus, or mosses. To spark, this material needs to be as dry and finely shredded as possible. Wood logs: This is the large, sustainable material used to keep the fire going once it has caught flame from the kindling. The wood should be as dead and dry as possible to catch on fire faster. Find various sized logs to use once the fire gets larger and use an ax or knife to cut the wood into more combustible pieces. 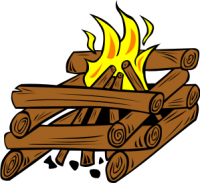 There are two popular methods of building a wood campfire, the “tepee” and “log cabin.” Although the tepee method is more popular, the log cabin method is better if you plan to cook over the fire. To build your tepee, wad the tinder into a ball about 4 inches in diameter and put it in the middle of your fire pit. Stack the kindling into a cone around it, then lean the logs on the kindling. If matches or a lighter are used in starting your fire, leave an opening in the tepee so you can light the pile of tinder from the bottom. If the tinder lights, it will spread to the kindling and logs and give you a great campfire. Blowing softly on the fire might be necessary to create flames to spread to the kindling and wood. If the fire goes out, try adding more tinder or kindling. Your burning materials might also be too wet to burn. Once your campfire is going, keep adding logs in the tepee pattern. 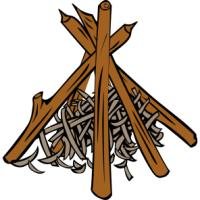 For the log cabin method, you may want to build a small tepee of tinder and kindling in the middle of your “cabin.” Once this is done, stack your logs a foot or less apart in an alternating pattern around the tepee in the shape of a square. The space between logs will allow for air circulation from the bottom to the top of the cabin. Once you have built the log cabin as large as you’d like, light the kindling in the middle. If the fire struggles to burn, blow into the tepee or dig small air holes underneath the base logs. Be sure to keep your fire to a reasonable and safe size. Be sure to never build your fire near vegetation, low-hanging branches, or closer than 6 feet from your shelter. Even if you find yourself without matches while hiking or backpacking, there are plenty of ways to start a fire without them. Below are a few of the most common methods of starting a campfire without the help of matches or a lighter. Flint and steel: Using flint and steel is one of the most primitive ways of starting a fire. There are multiple ways of using it and making your own kit. For an in-depth look, see CampfireDude’s Flint and Steel article. Lenses (magnifying glass or eyeglasses): If it is a sunny day, angle your lens toward the sun. Put a ball of tinder under the lens as you concentrate the light into the smallest area possible. If you add water to the lens you will be able to intensify the beam. Steel wool and batteries: With a nine-volt battery and a strip of steel wool, simply touch the contacts of the battery to the wool. Blow on it gently to encourage flames and add it to your tinder. Household items: Common items that can be found at home can be used as a quick and easy fire starter. Items include clothes dryer lint (which is extremely lightweight), candles, insect repellents and alcohol hand sanitizers. Even if you may think your fire is completely out or can burn itself out, wind can come up and reignite the embers and make the fire start up again. 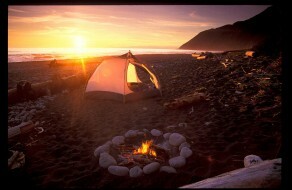 As a safety precaution, drown the campfire with water or dirt once you are finished. Stir the fire’s remains to uncover any hot embers and throw on more water or dirt. 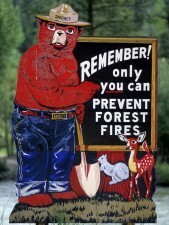 Remember, only you can prevent wildfires!